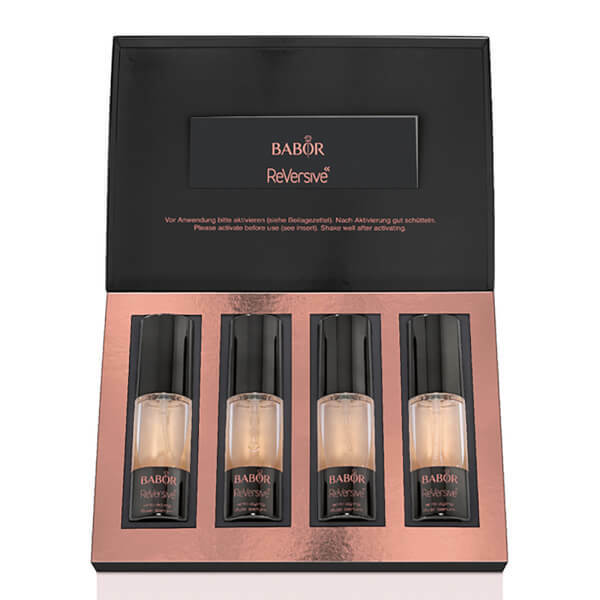 Slow down the visible signs of ageing with the BABOR ReVersive Anti-Aging Dual Serum; an intensive, four week treatment that works to reveal a youthful complexion. Arriving as four, weekly doses of anti-ageing serum, the ReVersive pack guarantees to transform skin. The ultra-fine micro-emulsion is absorbed both quickly and deeply, delivering essential moisture to skin that helps to make the face touchably soft and smooth. High performance actives Telovitin, Agicyl and Lumincol work in synergy to restore skin’s radiance and deliver an overall younger and firmer looking appearance. Over the four week course, skin’s beauty potential is revealed. Apply the activated serum after cleansing, to the face, neck and décolleté. Keep the bottle in an upright position and turn the anthracite bottle base to the right. Then hold the bottle upside down and shake vigorously. The serum is now ready for use. Apply mornings or evenings to the face, neck and décolleté. Apply to the skin and press in with the flat of your hands, then apply ReVersive cream. Should the phases separate, activate the micro-emulsion by shaking it again. The content of one bottle lasts for 7 days and should be used up in this period. Aqua, Squalane, Caprylic/Capric Triglyceride, Sorbitol, Polyglyceryl-5 Dioleate, Polyglyceryl-10 Diisostearate, Glyceryl Caprylate, Glycerin, Maris Aqua, Phenoxyethanol, Globularia Cordifolia Callus Culture Extract, Parfum, Teprenone, Disodium Edta, Ethylhexylglycerin, Butylphenyl Methylpropional, Hydroxyisohexyl 3-Cyclohexene Carboxaldehyde, Hydrolyzed Algae Extract, Plankton Extract, Helianthus Annuus Seed Oil, Tocopherol, Sodium Hydroxide, Limonene, Potassium Sorbate, Hexyl Cinnamal, Ci 15510, Ci 16035.